The AVInteriors will help you with common sense panel applications that will vastly improve your sound system's performance - plus add stylish decor to your room. Our product experts are also able to help you with more sophisticated room treatment analysis and improved sound recommendations, including much better bass response. Our 1" and 2" Deep Wood Framed Acoustic Panels are available with unfinished wood frames (ready to paint of stain), or affordable black painted frames, or even with custom stains and painted/coated finished by request - this adds about 20% to the price - contact us for details. Combine frames with our designer fabrics and you have a great combination of form and functional sound quality improvement. Buy 4 or more and save big! Enter 4 or more into the shopping cart to see the quantity pricing savings. 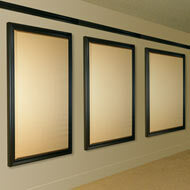 CineCoustic™ Framed Room Acoustic Panels - call for quantity deals , custom and large sizes. 1 and 2 Inch Deep Framed Fiberglass Panels with Resin Reinforced Edges and Designer Fabric - our low discount prices include metal impaler clips with permanent adhesive, but instead, we can include permanent adhesive along with a quick set spray adhesive to make mounting easy, if preferred. As these are custom manufactured products, pre-payment is required and there are no returns for refund or exchange. Contact us or call toll free #866-243-1001 for pricing, larger package price deals and for pay by check discount pricing. The panels take about 2 weeks to manufacture for smaller orders and 3 weeks, or more, for larger orders - contact us for production times.